That haunts the lanes around this time of year. And leave me stranded, beaten and deflated. I’ll ride prepared to turn around – or walk. Seems our local farmers are obsessed with trimming their hedges. All autumn they were out there with their big mechanical flails, and now they’re at it again, leaving every lane like a bed of nails, and the dreaded P*ncture Fairy rubbing her hands with glee. It’s something to occupy the winter months, and as an erstwhile agriculturalist myself, I appreciate the husbandry benefits – but as a cyclist, I wish they’d leave the poor hedges alone for a bit! Drove inland from Gold Beach that Longest Day. And time’s the only thing we’ll ever kill. A just and righteous war we’re proud to fight. In life’s unending struggle to be free. 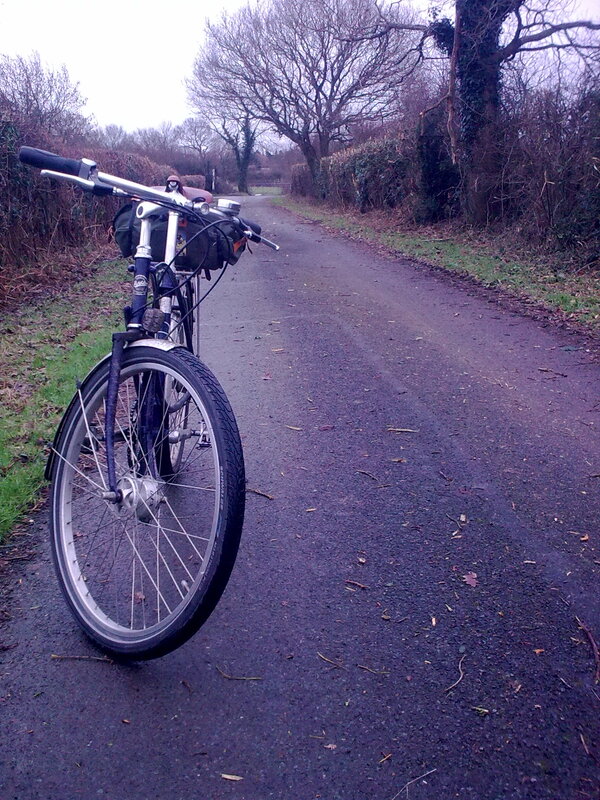 A little tribute to my faithful 1940s-replica Pashley Paramount: now the snow’s gone at last, we’re back on the road, doing battle with floods…the poor old bike certainly doesn’t look as shiny as it did when I took its picture in Brittany last summer. N.
Of fodder, and the warmth of wool and wood. And now it seems that Progress counts for naught. And held by one hand’s-breadth of hard-packed ice. For all our cleverness, we’ve been undone. We’ll go afoot, and so await the sun. Once again, our sceptred isle has been paralysed by a modest, and long-expected, fall of snow: a couple of inches of the blessed stuff and we’re back in the Middle Ages. It’s wearisome, frankly. Stay safe and warm, everybody. N.
Alone behind his ancient walls, he waits. Hang by a thread, and hope is fading fast. Word will not come, for night is almost past. This scarlet dawn, he knows, will be his last. Another Chaucerian rondel, with (I hope) a suitably medieval feel. N.
Let hearts find rest, and day-bound dreams take flight. It’s late. The midnight hour’s already passed. Lay books and pen aside, put out the light. And so, the time for sleep rolls round at last. Days seem unending, yet they fly too fast. In silent stillness we may find respite. No more to say now, no words left to write. Yet another venerable and hitherto-untried form – the Chaucerian rondel (I kid you not): just the two rhymes, plus a refrain line (A), giving a rhyme scheme Abb abA abbA. Simple, but fun. N.
All weariness, dark thought and sombre speech. Into our hearts and days, and say as much. Many things catch my eye when I’m out and about on the bike, but one sight that never fails to cheer me is a bullfinch – especially in winter, when the male’s vivid pink plumage positively glows against the grey of the hedgerows. Having never managed to photograph him, I’ve been meaning to write about him for ages, and here he is at last. I think of his splash of colour in the drab countryside as the opposite of the memento mori lurking in the background in old paintings – a reminder of life that does me good every time it see it. N.
All day the crow-black clouds have grown. And high-hedged lanes I walk alone. With teeth and fists and dark intent. The world the wild wind’s instrument. A lean wolf stalking round the hill. The twilight yields without a fight. But long miles lie before me still. Old oak, black iron, bolted fast. Where my road ends; I’ll march no more. Find rest until the storm has passed. And with it, hope for better things. And warm me on my wanderings. More from our festive sojourn in west Wales, and another form I’d not tried before – the rondelet. Like the triolet, it has a refrain line (A), which in this case appears three times and is written in iambic dimeter; the rest is in iambic tetrameter. The rhyme scheme is AbAabbA. Having played around with it a bit, I must say I like its straightforwardness and economy. It has a rather ‘naïve art’ feel to it, so I chose simple subjects, which ended up telling an equally uncomplicated story, partly inspired by some memorably weather-beaten walks in the country around my mother-in-law’s house. As well as the red kite, the wolf, extinct in this islands for almost three centuries, emerged unlooked-for as a recurring theme (can’t quite bring myself to use the term ‘motif’) while we were away. It may have something to do with my reading over the last few weeks, which has consisted largely of the Norse legends and Icelandic sagas! He’ll be back again soon, I’m sure. N.